“Human beings have two main instincts: the instinct of self-protection and the instinct to reproduce,” says Dr Nayana Patel. And she should know – she has carved out a career matching infertile couples with poor women willing to “rent their wombs”. 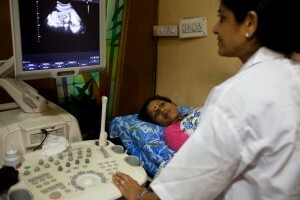 Beginning with a couple of surrogacies a year in 2003, Dr Patel’s Akanksha Infertility Clinic in the west Indian state of Gujarat, now delivers around 110 surrogate babies a year. Commercial surrogacy is highly controversial and banned in many countries across the world. But in India, a socially conservative society, surrogacy has thrived since the Supreme High Court of India legalised the practice in 2002, with a report by the Confederation of Indian Industry estimating the industry will generate $2.3bn (1.5bn euros) annually by 2012. Women’s rights advocates claim that in the absence of a clear law on surrogacy in India, the commercialisation of an unregulated sector has left room for unethical medical practices and the exploitation of both surrogates and infertile couples. Partly due to pressure from campaigners, the Indian government set out a draft bill last year, which aims to limit the age of surrogate mothers to 35, imposes a maximum of five pregnancies – including their own children – and makes medical insurance mandatory. Attempting to avoid messy legal battles that have occurred in the past, another proposal makes it compulsory for prospective parents prove that any infant born to a surrogate mother will have automatic citizenship in their home countries. The bill also aims to stop clinics sourcing, supplying and taking care of the surrogate mothers themselves. 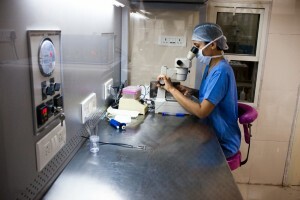 However, for now, it’s business as usual at Akanksha Infertility Clinic. It’s a little after 10 on a Wednesday morning as Dr Patel arrives at the clinic. Inside, there is a flurry of activity. Medical staff clad in light and navy blue run about, calling out names and carrying files. The lobby is full of women in brightly coloured saris, while others are in Western clothes. They are either desperately seeking a baby of their own or seeking to lift themselves out of poverty and offer their own children a better life. One of the main attractions of surrogacy in India is the price. Most of Dr Patel’s clients are from the US, Canada and Europe. Where it is legal, surrogacy in Western countries can cost 70,000 euros. At Dr Patel’s Akanksha Infertility Clinic, tucked down a narrow lane behind a chaotic market in Anand, it costs around a third of that. For the surrogates, who get paid between 4,700 and 5,500 euros by the clinic, the money is worth several years’ income and is a fast track out of poverty. When 32-year-old Ranju Rajubhai’s husband sustained severe burns in an accident in 2007 and could no longer work, surrogacy was the answer to the couple’s problems. “I thought I’ll be doing a good deed, my work will also get done and [the couple] will also get a baby,” says Rajubhai who is due to give birth to a surrogate baby in a month. Like all the women signed on by Patel’s Akanksha Fertility Clinic, Rajubhai will get a minimum of around £4,000, equivalent to seven years of her husband’s salary. “I will get my husband’s surgery done [for his burns],” she says. Pathan’s sharp remark offers a glimpse into the inner world of surrogates and the price they pay to fulfil their dreams of upward mobility. While Patel makes buy-in from spouses and immediate family a pre-requisite for surrogacy (something that the pending regulation will seek in enforce as well), almost all of them hide it from their communities and neighbourhoods fearing social ostracisation. The time spent at the surrogate house creates a sense of sisterhood. They enjoy the rest and care they might not have had during their own pregnancies but are confined to the house for the entire duration of pregnancy. Their families are allowed to visit on Sundays but the surrogates are not allowed to leave the house premises except for regular medical check-ups or a family emergency. Slender-framed with green eyes and short-cropped blonde hair, 38-year-old Robyn Wright runs a small beauty salon in Wilson, Wyoming. She has a 14-year-old daughter from her first marriage but a haemorrhage after the birth led to a hysterectomy. When she met Jason, a guide at Yellowstone National Park, the couple wanted their own biological child. The Wrights candidly admit they “weren’t born rich” and don’t “live on credit”. Realising surrogacy in the US was financially impossible, the Wrights staked all their savings and travelled half way across the globe to fulfil their dream. Dr Patel says laws governing surrogacy in the US, for example, are weighted too much in favour of the surrogate mother. She says she’s in favour of regulation in India but that ultimately it depends on the ethics of the people involved, not any law. Back at Patel’s clinic, three women who have each travelled from North America hoping to find a surrogate mother to bear them a baby are gushing over a newborn European baby recently born to one of the surrogates at the clinic – proof that their dreams could also come true. “There’s no perfect system, but given what we have and under the circumstances, Dr. Patel’s clinic definitely helps create miracles,” says Fatima, a Canadian.